Building a career in science can be a tiring and difficult process, and it is particularly precarious at the early-career stage. Time is usually spent on long hours in the field, in the lab, giving lectures, writing papers and grant applications, or attending conferences. For many, there is a constant fear about future employment - especially in academia, where short-term contracts and career gaps are becoming the norm. The stress from it all can and does influence our personal lives. 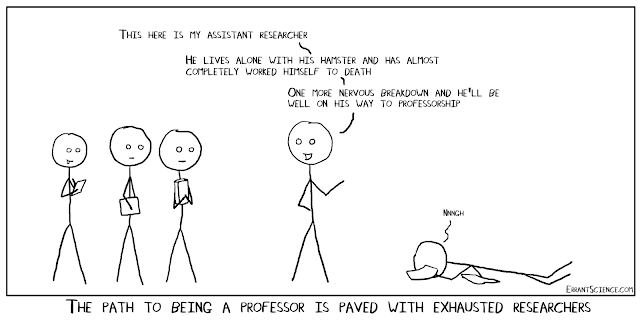 There has been a big push in academia to teach early-career researchers how to manage and/or balance work and life. However, it can be a daunting thing to actually implement these changes. To help aid early-career researchers in their quest to balance work-life, we asked the PAGES community to share their views and advice. Although we know that experiences and views may differ considerably from person to person and from country to country, here we share three perspectives, each from people at different stages of the career. Our three authors have one thing in common though - they have figured out for themselves how to maintain a healthy balance and enjoy both life and academia. This picture, as well as all comics below, were drawn by Matthew Partridge. For more, check out ErrantScience. I am a paleoclimatologist and an organic and stable isotope geochemist, starting my third year as an Assistant Professor in the Department of Geology at the University at Buffalo (UB). I got my PhD at Brown University and did a postdoc at UMass Amherst. My partner, also an academic, and I have two children, both under 4 years old. The children are the primary focus of the “life” portion of our “work-life balance”. Balancing work and life is both easy (children take priority) and hard, especially when deadlines are looming. Rolling proposal deadlines are great for work-life balance: if I need extra time because a child gets sick, I can take the time without harming my career. We are extremely lucky to have excellent childcare on campus, which allows us to focus on our work. In contrast, dependent care during conferences poses a challenge. If we both attend a conference, we can either take the children with us or we can have someone care for them at home. Many conferences have on-site childcare, but after one traumatic experience, I am reticent to try on-site childcare again. The added expenses of bringing children and alternate caregivers to a conference are large. It is also expensive to hire a caregiver for a week at home. At UB there is currently no mechanism for reimbursement for dependent care expenses, despite them being necessary for conference attendance. Thankfully, there is change in the air. We are advocating developing a dependent care policy at UB, and our dean is supportive. A number of academic mothers published suggestions to encourage conference attendance by mothers of young children (Calisi & a Working Group of Mothers in Science, 2018). I was delighted to learn recently that the National Geographic Society, through support from Lyda Hill, has funding for its female explorers to attend conferences and to support dependent care during conferences. Conference attendance is absolutely critical for ECRs, and universities and funding agencies must therefore routinely support conference attendance, in all ways necessary, for ECRs. How do I fit in other important things in life? Sleep is a priority, and many nights I go to bed when the children do. We exercise during our commute: we bike into school, pulling a trailer with the children. I always climb the stairs up eight stories to my office. We hang out with friends who are okay with going to the zoo and eating dinner at 6:30 pm. We schedule date nights months in advance, so we have a babysitter lined up at least once each month. There’s enough spontaneity in our lives with children learning how to walk, draw pictures, bike, catch frogs, and tell stories, so we look forward to one quiet night to ourselves. The advantages of being an Assistant Professor in a dual career couple with two young children are many. I love being a scientist: it is exhilarating to have a job that is limited only by current technology and our collective creativity. Work-life balance is incredibly easy. Our workday ends at 5pm sharp, when we go home, play with the children, and take our minds off of work. My productivity skyrocketed when I had children, as I learned to make the most of the hours I have at work. Working makes me a better parent, and parenting makes me a better and more productive researcher. Growing up in a river valley, I have always been fascinated by nature. When I was a boy, I spent my time learning about the local potholes and fish in the river. That is why I eventually decided to study natural sciences, geology and biology , and that is why I live in the countryside. Actually, I live now in the middle of a forest, which is surrounded by a soothing cultural landscape. Isolated in a sense, just as I like it. Although I also have a technical background in mechanical engineering, which conveniently provides me the skills needed to fix my tractors, I have made most of my career as a researcher studying natural phenomena - climate change, biogeochemical cycling, lake ecosystem functioning and whatnot. At our forest home and at our summer cottage by a lake, which is even deeper in the boreal taiga forest, I am able to constantly observe these nature dynamics at my free time together with my wife, cat and two Finnish Lapphund dogs. But outside the office, I do not think of work. Being in nature is different than writing a scientific paper about it, you feel like you belong there. A feeling you can sometimes get when doing fieldwork at a remote pristine site with your favorite colleagues. Besides watching ice hockey, living in an old wild boar ranch pretty much takes all my spare time leaving no room for work-related stress. There is always a lot to do, despite the boars being gone. I never work on weekends and I keep my workdays short enough so that I have time to live my life. The real life. Whenever possible, I like to step into the wild and dark side and head to the city to see my favorite bands playing at smoky rock clubs. Extreme grinding music is a nice change between office or laboratory work and an everyday walk in the woods. Sometimes you need to release some steam, especially after giving a lecture or correcting a manuscript following comments by an anonymous reviewer. An awkward transition from the grinding music topic – I have also started to grind grains, as I revived my old hobby of making beer. If you want a good brew, the process is rather demanding and requires patience and precision, just like research, but the output is almost always tremendously rewarding. A pint of lager, pale ale, sour ale, wheat ale or the traditional Finnish farmhouse ale, sahti, is simply delicious, but also helps to relax when mentally stressed. A stout guarantees a good night sleep. This will also be my next career step, since after my current projects end in August 2023, I plan to commercialize the business and start making local craft beer at my own brewery. I am not leaving science though, because there is a lot of science in brewing with laboratory experiments and all kinds of cool measurements and equipment. Hence, as a brewmaster I can still put on my cozy lab coat. Cheers! I had very little life till my PhD ended, just lots of work. It is difficult to have a healthy work-life balance when you are judged not on the amount of productive work being done but rather on the number of hours spent in the laboratory. During my PhD there was an expectation that we would work long hours on weekdays and work on weekends as well. Family life suffers too, not just because of the long hours but also because there is so little money as a PhD student. When doing a PhD, we are of an age where we hope to take some responsibility to take care of parents and family, but there’s just no money for that. Conversely, a job in the mining or oil industry would have paid me very well. During my PhD I wondered if I had made the right life choices. 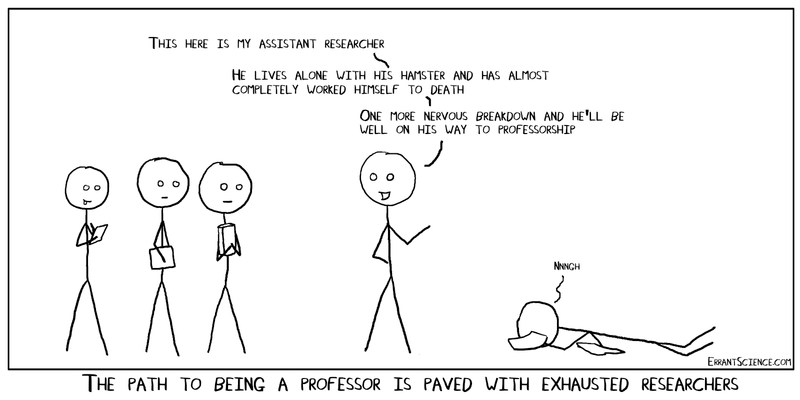 While I was a student during my PhD I was up for late nights and I have some fond memories of it, but I really thought things would change at the post-doctorate level. A post-doctorate is a job as an employee with all the regular rights and duties that an employee may have as a member of the organization. Further, it should be an opportunity to apply skills learnt during the PhD and to diversify. On the contrary, at my first post-doctorate I found that I was expected to work 13-hour days processing samples repetitively. Again, there was just no opportunity for life and the work wasn’t what I was hoping to produce. I feel like many times women in my country have to choose between the two - work or life. To me it was like two banks of a river and building a bridge connecting the two sides was extremely challenging. But I wanted to build the bridge. I left my first post-doctorate lab and joined a female professor. She is a prolific scientist and an inspiring persona. Someone who, to me, has perfect balance in work and life. With her, I learned that enjoying your work and life at the same time is possible. She has a three-year-old daughter, whom she brings to her office, puts her in a crib and works tirelessly. She handles a big international project on her own. She has many students and a big lab to take care of. And she seems to do it so effortlessly. When my husband was coming to visit me, I told her I need to take a leave of absence for a day to receive him. All she said was “you don’t need to inform me of your routine. You are free to plan the experiments according to your convenience.” I was shocked because I had forgotten that freedom exists in work, even in science labs and field-based work. With her, I started enjoying my work again. It is no more a mandatory routine. I read research articles, books, work in the lab in the day, have dance classes in the evening. I do trekking when I have a day off. I am learning landscape photography, cooking, quilling, gardening. I have enough time to spend with my husband. I am finally getting to that balance in work and life. In my opinion, finding the right people, who will keep you motivated in work and in life, is very important. We thank our three contributors for sharing their experiences with the community and hope you enjoyed reading about them. As everyone’s experiences are different, please share your thoughts on work-life balance in the comment section below, or contact us if you’d like to write a post.